Bob is back, but who is this Master Raven? The Evolution Fighting Championships 2016—the World Cup/Super Bowl of the beat ‘em up spectrum—took place in Las Vegas this weekend. 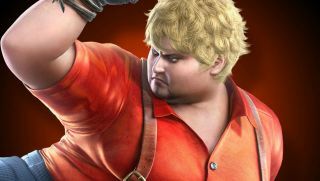 The event served up some typically fast and furious competition, and Tekken director Katsuhiro Harada used the tourney to reveal two new Tekken 7 combatants: Bob and Master Raven. The trailer above introduces freestyle Karate enthusiast Bob, who might recognise from Tekken 6, Bloodline Retribution, Tekken Tag Tournament 2, and Street Fighter X Tekken; however Master Raven is new, and may be somehow tied to the existing and ever-mysterious Raven. Tekken 7 is expected to arrive in early 2017. In the meantime, why not check out 11 minutes in-game footage from this year's E3?